Visit the Nature Centre's Upcoming Events page (UPDATED Aug 12) and ECFNC Activities page for upcoming programs. Monday, August 25: Common Nighthawks are beginning to migrate through Windsor. Three were seen flying overhead at dusk yesterday. Orioles and Eastern Kingbirds have been the most conspicuous early migrants at Ojibway over the past week. The sound of insects is one of the most distinctive features of late summer, whether the calls of cicadas and grasshoppers during the day or the diverse assemblage of crickets and katydids during the night (such as Northern True Katydids Pterophylla camellifolia). To learn more about insect song visit the Singing Insects of North America web page. 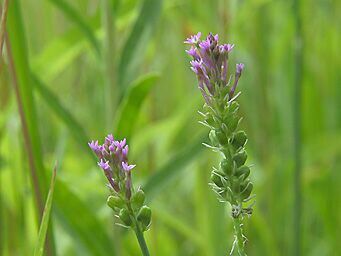 Wednesday, August 6: Pink Milkwort, Polygala incarnata, is the latest addition to Ontario's Endangered Species Act. This small pink wildflower is found in only two locations in Canada: the Ojibway Prairie and Walpole Island. Two dozen plants were seen in bloom today in the provincial nature reserve. This tiny flower is easily overlooked among the abundant prairie wildflowers of early August such as Tall Ironweed Vernonia missourica, Early Goldenrod Solidago juncea, Showy Tick Trefoil Desmodium canadense, Culver's root Veronicastrum virginicum, Gray-headed Coneflower Ratibida pinnata, Bergamot Monarda fistulosa, Flowering Spurge Euphorbia collorata and Dense Blazing Star Liatris spicata.